Christmas Fair set to be a ‘cracker’!! 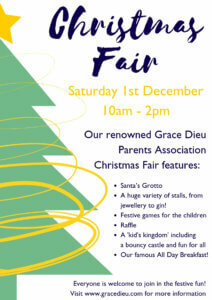 Grace Dieu’s annual Christmas Fair is on the 1st December. Organised and run by the hardworking GDPA, it’s set to be another fantastic event! Each year the event attracts families and members of the local community to the School – to begin their festivities and to kick start their Christmas shopping. The School year has already started in fundraising style, following the GDPA’s fantastic inaugural Outdoor Cinema event when ‘The Greatest Showman’ was shown on the big screen in Grace Dieu’s wonderful grounds! Do come along and support our Christmas Fair – we look forward to seeing you all there!